It is without a doubt that stem cells are an exciting innovation that is showing promise across the field of medicine.1 Due to their regeneration properties, the use of stem cells has become more common in the skincare arena. 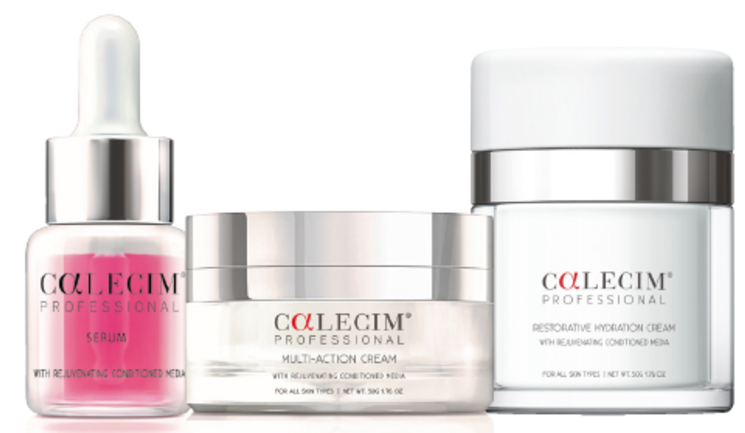 Calecim Professional is the latest stem cell innovation to hit the UK skincare market. There are three products within the Calecim Professional range: Serum, with 80% CLCM, Multi-Action Cream, with 50% CLCM and Restorative Hydration Cream, with 40% CLCM. Each contains a different concentration of hyaluronic acid, consolidated peptides or glycoproteins, fibronectin, albumin and soluble collagen.2 Studies As Dr Day points out, CLCM was first developed and used for wound healing and other medical applications before aesthetics. “I think it’s the proper way to do things, to see if you can improve burns, chronic wounds, scars and other conditions and then see if there are aesthetic applications as well,” she states. According to Dr Day, Calecim can be used both as an in-clinic application after aesthetic procedures and at home. “I use this routinely after both ablative and non-ablative laser treatments. I use the Serum immediately after the treatment and then I give patients the remaining product to use at home. Then I give them one of the Calecim creams to take home as part of their treatment regime,” she explains. Dr Day states that she has had especially good patient feedback after ablative treatments, she says, “Patients have told me that it feels soothing because it takes away the heat and the burning sensation and gives them instant relief.” As well as this, Dr Day also uses Calecim in other areas within her clinic. “I use the Serum for microneedling because it contains HA. In my hands, I find that this works as well as platelet rich plasma so can therefore save a lot of money for patients,” she explains. Dr Day has not noted any reactions to the products after using it for more than six months in her clinic, however says that as the Restorative Hydration Cream contains fragrance, reactions could be possible. Because of this, she states, “I use the Serum and then the Multi-Action Cream without the fragrance immediately after treatment for a week.” For maintenance, she notes that patients can choose to use the Hydration Cream which has fragrance in it. “The Serum and Multi-Action Cream have a little bit of a protein smell because they are so highly protein derived and not everyone likes that smell, so you have to take that into account,” she explains. Rivka C. Stone, Irena Pastar, Nkemcho Ojeh, Vivien Chen, et al, Epithelial-Mesenchymal Transition in Tissue Repair and Fibrosis, Cell Tissue Res, 2016 Sep; 365(3): 495–506. Lim, IJ & Phan TT, ‘Epithelial and Mesanchymal Stem Cells From the Umbilical Cord Lining Membrane’, Cell Transplantation, Vol 23, 2014 pp.497-503. Vangsness CT, Sternberg H, Harris L, ‘Umbilical Cord Tissue Offers the Greatest Number of Harvestable Mesenchymal Stem Cells for Research and Clinical Application: A Literature Review of Different Harvest Sites’, Arthroscopy. 2015 Sep;31(9):1836-43. W. Olaya, Kate Kim, D. Kim, ‘CALECIM® Serum Reduces CO2 Laser Treatment Erythema & Edema: a Randomized Controlled Double-blind Split-face Trial’, Mission Viejo, California, U.S.A.
Dr Ziv peled, ‘Improvements in Skin Tone and Cosmesis with Umbilical Cord Lining Extract Calecim: A Same Patient Control Study’, San Francisco, California. 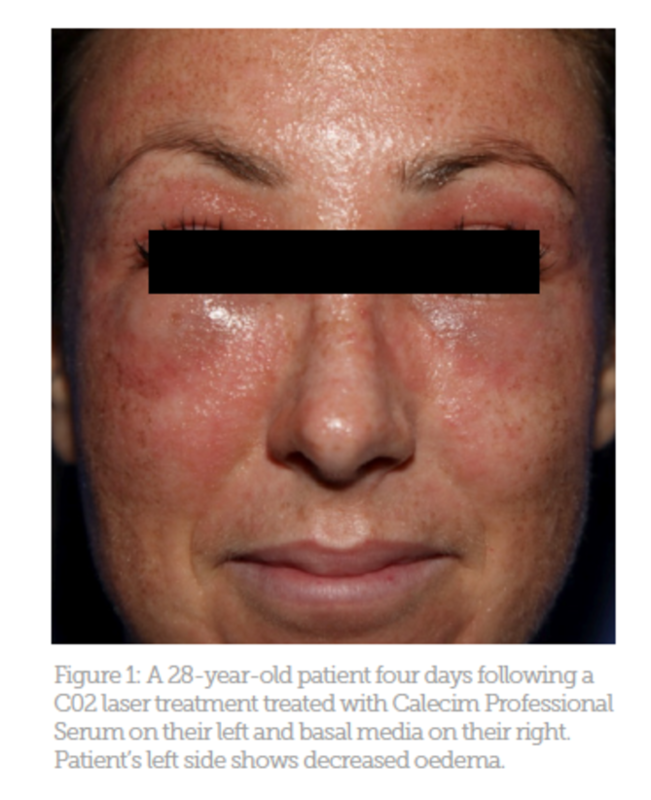 Figure 1: A 28-year-old patient four days following a C02 laser treatment treated with Calecim Professional Serum on their left and basal media on their right. Patient’s left side shows decreased oedema.